So you’re a higher ed manager who’s just been handed the keys to your institution’s website. Congratulations… and condolences. Chances are that (unlike at, say, a Silicon Valley startup) very few people in your organization have any idea what kind of resources are required to keep a website both functioning smoothly and useful to its audience. Maybe that’s even true for you. Maybe you’re a VP of Marketing and the web team has just been reorged into your division, or you’re the new Director of Admissions at a school where the website falls under that department. Or maybe your institution’s leadership has just handed you a blank check and told you to put together your perfect web team, and you’re not entirely sure where to start (hey, we all have to dream, right?). If so, you’ve come to the right place. What follows is advice based on my own two decades working on the web in higher ed, as well as dozens of discussions over the years with higher ed colleagues from around the world. By far the biggest complaint I hear from web team managers is a lack of human resources—they just don’t have enough people with the right skills to do the job the right way. We are expected to create websites that live up to user expectations set by major corporations, without having the money to hire the breadth of talent that those corporations recognize as vital to producing a world-class user experience. As a result, we often wind up holding sites together with virtual chewing gum and duct tape because everyone on the team is forced to reach outside their existing skillsets. Of course, having to stretch one’s limits occasionally is a good thing, but having to do it on a regular basis is not sustainable. In the end, your students will be the ones who suffer the consequences of a poorly organized, poorly performing website. I recognize that every school is different, with its own set of historical circumstances, political landmines, and vestigial bureaucratic oddities that might prevent you from needing or being able to build a team like this. And it may well be that I’ve forgotten something below, or have a different understanding of something based on my own unique experiences of the schools I’ve worked at. If that’s the case, I encourage you to please chime in in the comments. The size of your school (in terms of number of students) makes very little difference in the size of the web team or breadth of skills required to build and maintain a high-quality website. Small schools require the same skillset as large schools. Sure, if you are a client services shop at a huge state school that serves dozens of internal clients, you may need more representation of some of these skills; but you can’t skimp on any of them just because your school is smaller. Not every one of these skill bundles needs to be represented by a single person, but I am fairly confident that you will get better results if they are. Some of the skills below will overlap slightly with each other (see the diagram at the end of the post), but most of them are fundamentally distinct. Perhaps there are a handful of unicorns out there who manage to not only develop but *maintain* a majority of these skills, despite the dizzyingly exponential pace with which knowledge in our industry increases. Even if you find one of them (and I’ve actually met a few over the years) you will likely not be able to afford them, or keep them around for long. The “webmaster” who used to be able to handle all aspects of your website no longer exists; make sure that they are replaced by a diverse, well-trained, and well-resourced team of professionals. Systems Administration & Security: At the foundation of your web presence is the server. Making sure that it is properly maintained, tuned, patched, and secure may or may not be a full-time job, depending on the number of sites you maintain, but it is a vital one regardless. These days more and more schools are outsourcing many of these duties to large hosting companies; if you still maintain servers on-premises, this position could potentially be shared with other IT duties. Database Management and Data Integration: Long gone are the days when institution’s websites consisted of a series of flat HTML files sitting on a server; today most of what you see in a web browser is generated dynamically on the fly from a multitude of databases, including not only your content management system but everything from student information systems to course catalogs to sports information systems. Someone has to maintain those systems, figure out how they can all be made to work together, and ensure that they are secured from the curious or nefarious. Content Management System Development: Virtually every higher ed site these days is built on some form of content management system. Whether it’s WordPress, Drupal, or one of half a dozen proprietary systems that specialize in the higher ed market, a deep understanding of how that system works and the language it’s built in is absolutely critical to customizing your site to your institution’s needs. User Experience Architecture: The job of the UX architect is to ensure that your site’s visitors are able to complete the tasks for which they came to your site with the least amount of friction possible. Some of the work they might do could include: collaborating with the content strategist on information architecture; user testing; working with the analytics specialist to identify potential user barriers; working with the UI developer and designer to redesign a site’s interface. User Interface Design: Based on the vision of the UX architect, the UI designer creates the concrete visual elements that one sees on the page, from determining font size and line-height to the color that buttons will turn when you mouse over them. The designer should also work with the content manager and multimedia producer to ensure that brand standards are properly implemented throughout the site and any ancillary materials (for example, social media avatars and cover photos). Content Strategy: Someone needs to see your site’s content forest for its content trees and maintain a holistic view of how the entire site fits together. A content strategist deals with the intersection of content (what gets posted/removed and when), people (who does the posting) and technology (what tools or platforms are best suited to reach the audience you’re trying to reach.) 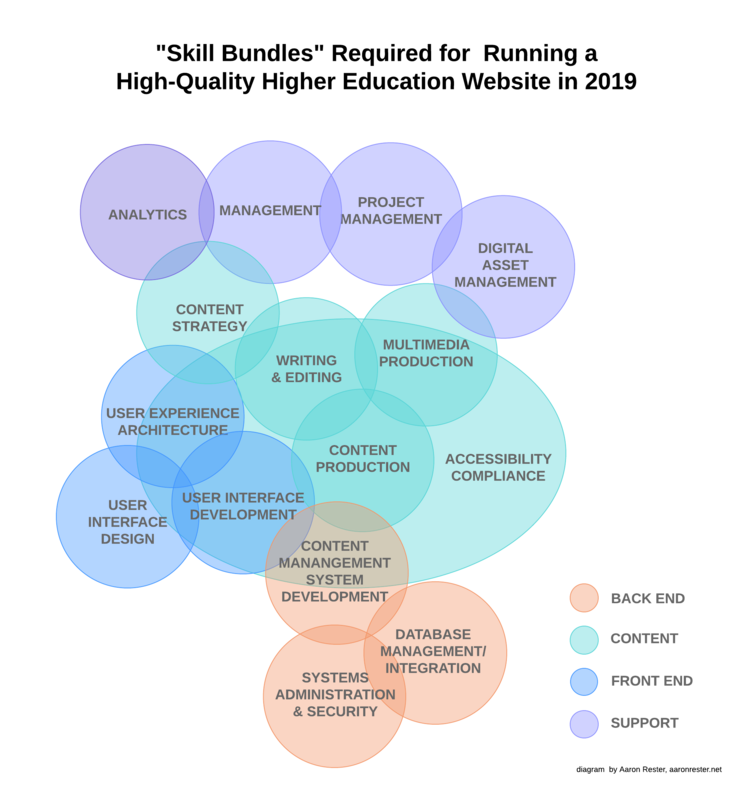 A content strategist may also deal with information architecture, ensuring content is properly structured for reuse on multiple platforms, and creating and enforcing content governance policy and procedures. Web Writing and Editing: Many content strategists started out as writers or editors, but being able to craft well-written content for the web is its own stand-alone skill. A web writer needs to understand not only how to communicate a message effectively in concise, to-the-point language, but they also need to know how to structure that message in ways that are accessible, optimized for search engines, and in accordance with brand standards. This is why the distributed authorship model that so many schools employ, in which web content creation is foisted off as an afterthought on un- or under-trained secretaries and faculty members, so often results in poor quality content. If multiple individuals are creating content for the site, an editor needs to be involved to ensure consistency in language, tone and voice, as well as proper grammar and punctuation. Content Production: A writer may craft the words in your content, but getting those words into your content management system is a different matter. The Content Producer is to web content what a music producer is to a hit single—taking the raw material and ensuring that it is polished and perfectly adapted to its medium before publication. This role requires a deep understanding of how your content management system works and how to ensure that content is properly marked up for usability, accessibility, and search engine optimization purposes. Multimedia Production: Video, images, and audio are more a part of the content landscape than ever before. Someone on your team needs to know not only how to capture or generate this content, but also how to appropriately process it for the various platforms on which your organization has a presence. Accessibility Compliance: Accessibility absolutely can not be an afterthought on the modern web—it must be baked into every stage of the design and development process. Truly understanding web accessibility requires knowledge of both technology and law, as well as the ability to deeply empathize with users whose life experience might be incredibly different than one’s own. Management: The department manager sets overall strategy, ensures everyone is working toward the same goals, and acts as ambassador to the rest of the institution, especially in the area of gathering community input and change management. Project Management: Where the department manager is concerned with big picture strategy, the project manager focuses on nuts and bolts and keeps things running on the ground. They manage budgets, set schedules, allocate human and financial resources, and make sure that deliverables are handed over on time and on budget. Digital Asset Management: Once your photos, videos and other media have been created, how do you store and retrieve them? Are they properly tagged and archived so that you can find appropriate quality version of the required file at a moment’s notice, on all of your platforms? Analytics: One of the great things about digital content is that it gives us the opportunity to track so much data, and everyone on your team should be making decisions based on that data. One of the terrible things about digital content is that it gives us the opportunity to track so much data, and hardly anyone knows how to properly read and dig into that data to produce actionable recommendations. Well, there you have it—a sketch of my ideal higher ed web team. If you’re a higher ed web pro, I’d love to hear your suggestions, your arguments, and your own experiences in this world. I also hope you will consider passing this on to your boss, as I think that while the needs for these skills may seem blindingly obvious to those of us in the trenches, they may never have ever been articulated to those with the power to make staffing decisions at your school. It’s that time of year once again… time for an endless parade of year-end best-of lists! Here is my contribution to the morass, along with a Spotify playlist featuring a song from each album. It was a tough call deciding on the top five, as it was basically a five-way tie for number one, and how I rank them will probably shift with my mood on any given day. Feel free to chime in with your own year-end lists in the comments! After figuring out how my hero was born, the next episode in the story that I wanted to tackle was his exile. In many versions of the Ramayana (IMVOTR), Rama is exiled to the forest for fourteen years by his father at the request of one of his father’s other wives, who wants the throne for her own son, Rama’s brother. His wife and some combination of his brothers vow to follow him into the forest, and they have many adventures while traveling across India. Americayana by Aaron Rester While trying to figure out why my hero would have to leave the family that had sacrificed so much to get him and head “out on the road” as I had already decided in “Burn So Bright,” I started thinking about how IMVOTR, Rama’s divine nature is unclear to the people around him (and sometimes even to himself). How unnerving it must be, I thought, to grow up around someone who just might be a god. That in turn made me think of the HBO series Carnivale, about a young man who discovers he can bring the dead back to life; shunned by his family for possessing these unnatural powers, he joins a traveling circus troupe (the series was unfortunately canceled before revealing the true nature of the struggle between the hero and his apparently evil counterpart, a charismatic preacher). Why not combine aspects of both of those characters, I thought, and have my hero exiled by a community suspicious of the glimpses of uncanny powers that even he does not understand, and forced to make his living traveling the land as a preacher? Willie Nelson’s Red Headed Stranger definitely had some influence in this idea as well. Musically, “Got to Go” is pretty straight-up rockabilly — there’s a lot of Johnny Cash’s “Folsom Prison Blues” in its DNA, especially in the lead guitar line. One slightly unusual aspect of the music is the percussion, which is made up largely of looped claps and table drumming; at this stage in the project I still had the idea that I was not going to use any software percussion, but rather just create loops of percussion I could do on my own. That idea didn’t stick, but it’s mostly in effect here. I’m also pretty happy with the distortion on the vocals and the harmonica, both of which were done through a Green Bullet microphone run through my guitar amp, in a nod to Little Walter. When I finally decided that “Burn So Bright” didn’t quite cover the whole story that I wanted to tell, and that I wanted to challenge myself to write an entire song cycle reimagining the Ramayana via country music, I also decided that I was going to try to write and record the whole album in sequence. While I had a rough idea of the various episodes that frequently occur retellings of the story, I wanted to see how each song would lead to the next lyrically and stylistically. So for the first song I was going to consciously write as part of this project, I wanted to start at the beginning of the story. In many versions of the Ramayana (I guess I need to start using the acronym IMVOTR, since I’m going to be using this qualification a lot in these blog posts) the story begins with Rama’s birth. Usually, the story goes, Rama is an avatar of Vishnu, who crosses over to Earth in order to defeat the demon king Ravana. This ten-headed rakshasa, for complicated reasons, can be killed neither by a god nor a man; a god who is also a man, however, seems to have been an acceptable loophole (protip for demons: always read the fine print). IMVOTR, Rama’s conception involves a long, complicated Vedic sacrifice performed by his father, King Dasaratha. As I thought about the kind of old, weird America where I intended to have the album unfold, I couldn’t figure out what the equivalent of such a sacrifice might be in such a milieu. Then I realized that that old standby of blues and Americana, the deal with the devil, was not unlike the ancient Vedic sacrifices — giving up something of value in the hope that a supernatural figure will provide what you want or need. I just needed to figure out why one of our hero’s parents would make that deal with the devil. At the time I was writing “A Small Sacrifice,” I had a number of friends and relatives who were trying to have children, and it got me thinking about the lengths that people will go to become parents — frustrating years of trying IVF or other therapies, traveling to distant continents to adopt, and so on. Like Dasaratha, they were making profound efforts to get something they desperately wanted. Perhaps one of our hero’s parents would desire his birth so deeply that they’d be willing to give up their lives to make it happen. In the end, I decided to tell the story from the point of view of our hero’s mother, whose desire for a child leads her to make a deal with the local priest, who may or may not be a representative of the divine, or the diabolical. The actual recording of the song started with the rhythm track, which is just a sample of a vinyl record that I slightly chopped up to provide a steady 4/4 beat. The chord progression is very simple, and repeats throughout the song, so to keep it interesting I started it out very sparse and added new elements with each verse — this kind of layering is something I do on a lot of songs. The first stringed instrument you hear is a ukulele, filtered through GarageBand’s “Telephone” effect. The next verse introduces an acoustic guitar and a tinkling piano, then a banjo, then a tambourine and bass. The latter two were software instruments on GarageBand, since I didn’t own a bass yet; even after I bought one a couple years later and went back to re-record live some of the software bass parts I had been working with, I decided to leave this one as is. It’s so simple and, to me, perfect, that I could only screw it up by trying to make it more complicated. Finally, I added in a Telecaster played through my then-brand-new Fender Twin Reverb amp; I was (and still am) enamored with that classic vintage reverb sound, and you’ll hear it all over this record. The thing that really ties the song together, though, is that haunting sample that starts the song and loops throughout the entire tune. I knew I wanted to add some kind of sample to add the feel of “ritual,” and I scoured Freesound.org for just the right one. When I stumbled upon this recording of a church choir in Holland, it felt perfect. Even though its rhythm is nothing like that of “A Small Sacrifice,” I love the way it winds in and out of the quiet spaces of the song, swelling and receding in a way that gave exactly the beautiful but slightly creepy texture I was looking for. In an interesting epilogue, when I finally finished the album a good five years or so after I originally downloaded Klankbeeld’s recording, I went back to Freesound to try to figure out where to provide attribution. It turned out that the original recording had been accidentally deleted and was no longer available. But since I still had a copy on my computer, I was able to return it to its grateful creator halfway around the world. Sometimes the internet is amazing. The post below is condensed from a presentation I gave at Confab Higher Ed in November, 2017. Most of the ideas below (the good ones, anyway) come from Gerry McGovern’s book The Stranger’s Long Neck. If you haven’t read it yet, go get yourself a copy right now. For many of us in higher ed, this is an all-too-familiar model for how our websites are set up. I call this the “Office of …” model, a model in which every office in department in an institution has its own small section of the web. Usually these start with “Welcome to the Office of … website!” and the proceed to outline the mission of the office, before (perhaps) outlining the responsibilities of the office and the services they provide. The “Office of…” model makes sense from a certain point of view: it’s very easy to maintain permissions in your content management system, and it reflects the mental model that we, as employees, have of the organization. Of course, problems do crop up when there are reorganizations (higher ed’s favorite pastime); these often lead to broken links, bad search results, and inaccurate or outdated information. But usually we just rename the webpages and carry on. But back to Luisa. She’s gone to the website looking to sign up for classes. With no clear signposts, she starts clicking around to try to figure out how to do so. She guesses it’s probably under “Academics,” but then isn’t quite sure where to go from there. She tries “Catalog” and gets a list of courses, but no way to sign up for them. She looks through the other options… what the heck is a “Registrar”? What on earth is a “Provost”? Annoyed, she goes to the search interface and types in “sign up for classes.” She gets a hundred results, scrolls through the first two pages, and, frustrated, closes her browser, thinking “I’ll come back and do this later.” Unfortunately, first-generation students, who generally don’t have the support systems or inherited knowledge of how to navigate college life of their peers, are prime candidates for “melt.” Luisa may never come back to choosing her classes, and may just never show up to the school she worked so hard to get into. Todd is a incoming transfer student from a local community college who has just received his first bill from your school. Now, Todd’s a junior — he’s been around a while, and he knows that higher ed likes to throw around weird jargon and acronyms and antiquated bureaucratic terms. He knows that when it’s time to pay his bill, he should look for the Office of Student Accounts; after all he’s been doing that for the last two years. 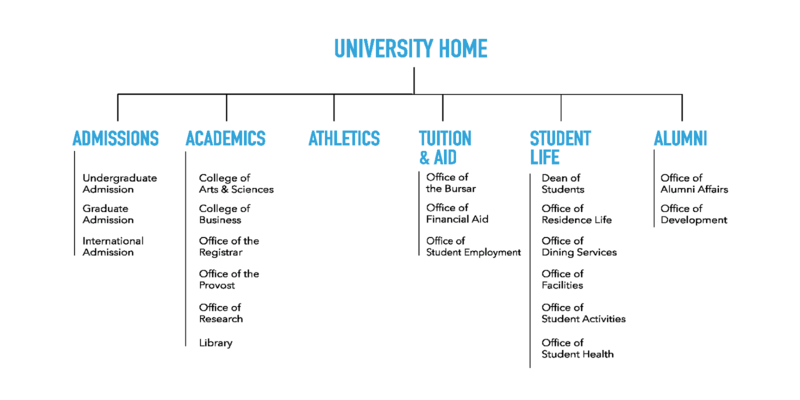 So he goes to the website and finds the same information architecture pictured above… and doesn’t see an Office of Student Accounts. If you’ve been around higher ed a while, you probably know that the Office of the Bursar probably has something to do with collecting tuition and fees, but how on earth would Todd know that? Why are we putting a linguistic barrier between our user and the action he’s trying to take, the action (giving us money) that affects everything from our operating budget to Todd’s ability to register for classes and take books out of the library. Under the “Office of…” model, if students don’t understand what departments do, we’re making it more difficult for them to accomplish what they need to get done, and more difficult for them to complete their educations. To get around this difficulty that we create for ourselves, we have two options: 1) we can educate students over and over about which departments provide a given service (until, of course, that department is reorganized and the service moves to a new department and we have to start over again) or 2) we can organize our websites around the students’ needs rather than the institution’s. At the university where I work, 45% of our students are first-generation, like Luisa. More than 50% are transfer students like Todd. These are real problems with real effects on our institution. So when the stars aligned for a site redesign in late 2015, I wanted to do something to help our students and help our institution get out of this trap we’d created for ourselves. Making the site responsive was the primary driver, but far more than design needed to be addressed. We had very little by way of formal governance in place, and our information architecture was a mess that was very much focused on the needs of institution. So I used this chance to reimagine our information architecture using a methodology created by Gerry McGovern known as “top tasks,” laid out in his book The Stranger’s Long Neck. At its core, “top tasks” is really just the radical idea that websites exist to help our users get stuff done. It seems obvious when you see it in print, but how often are pages created on your site to house information that someone *thinks* someone, somewhere, *might* need someday? Nobody cares about information for its own sake, except the creators of said information. The customer has a task they want to complete, a problem they want to solve. Information is only useful in the context of the task. Again, this seems really obvious once you see it in black and white. But if there is one thing that higher ed is incredibly good at, it’s producing information for its own sake. In some ways that’s really our raison d’etre. But if our website is going to be actually useful to our users, we have to fight that impulse at all costs. McGovern spells out three fundamental principles provide the rationale for his methodology. Every website has a small set of tasks that deliver a huge amount of value. In higher ed these are usually things like prospective students submitting applications, students registering for classes, or alumni making donations. These are the actions that keep the organization solvent and functioning. Every website has a large range of tiny tasks with the potential to deliver value, but also potential to destroy value by getting in the way of the top tasks. Less useful content gets in the way of user’s being able to quickly access the useful content. This is most likely that sparsely attended lecture put on by [insert your least favorite department here] that someone inexplicably feels should be on the institution’s home page. Focus relentlessly on helping your customers complete the top tasks as quickly and easily as possible. If you can truly nail the user experience for completing those tasks, you will ensure that your organization is getting the most value out of its website, and that the majority of your users will leave the site happy and satisfied. From his observations in working on websites for organizations ranging from multinational corporations to European governments, McGovern posits that a slightly modified version of the Pareto Principle applies to most websites: on average, 25% of a site’s effects will be generated by 5% of causes, and 60% of effect from 20% of causes. That is, 5% of the tasks users come to a website to complete will generate one quarter of its value, and one fifth of tasks will generate 60% of its value. The best user experiences, McGovern argues, will only happen when we concentrate on the “long neck” of tasks rather than the long tail. Particularly in instances where administrative resources are limited (looking at you, higher ed), both our organizations and our users are best served by concentrating our efforts on the long neck. Once you’ve decided to embrace top tasks as a methodology, McGovern offers three more principles to guide your efforts. Know your user’s long neck. Your opinion of what constitutes the long neck may be radically different than your users’ opinions. You have to do your research. Continuously improve your top tasks. Top tasks is a continuously iterative methodology. McGovern argues that you need to continually measure your users’ task success rate, disaster rate (when users think thy’ve successfully completed a task but haven’t), and completion time. Then you need to make tweaks, measure again, rinse and repeat. Manage with facts, not opinion. This is of course easier said than done; no matter how good your data, it can often be difficult to shake the gut instinct of a HiPPO. But whenever possible, base your arguments on the data available to you. Your first step in moving toward implementing top tasks is to establish the universe of all possible tasks. The goal is to generate a “longlist” of at least 100 tasks. There a few ways you can do this, and I found all of them to be helpful. You can gather qualitative information simply by talking to stakeholders about their own use of the website and their perceptions of their constituents’ use. You can gather survey data directly from your users with a freeform question such as “Why do you most often come to the website?” and use their responses to identify patterns. You can look at your analytics to see the most visited pages on your site, as well as what people are using your internal site search to look for on the site. You can conduct an analysis of your competitors to find out what tasks they appear to have optimized their sites for. As you assemble your list, try to word the items on it as verbs. For example, “library” might be one of the top searches on your site, but there are any number of tasks that users might be trying to complete with that search: finding out the hours the library is open, looking for research help, renewing a book they’ve checked out, and so on. Also, try to word the tasks in as natural language as possible; avoid the jargon of which higher ed is so fond. You can actually duplicate some tasks on your list using different wording (for example “register for classes” vs. “sign up for classes”) to see which version your users prefer. Once you have your longlist of possible tasks, the next step is to see which ones your users feel are most important to them. McGovern’s method for this is perhaps a bit surprising, and he spends a fair amount of time in the book effectively saying, “I know this sounds kind of crazy, but believe me, it works.” Essentially, you present your users with your entire longlist of tasks at once, and give them just five minutes to choose their five most important tasks. The task they choose as most important gets five points, the task they choose as second-most important gets four, and so on. This weighted voting method allows you, once you’re looking at the results, to really see items that jump out as most important to your users. I added an additional layer to this leg of the process. Since higher ed sites have so many different audiences, I had a hunch that different audiences would have different top tasks — after all, the things a prospective student comes to your site for are likely very different than the things an alumna comes to the site for. So the first question on our survey was to establish the respondent’s relationship to the university, and then frame the survey within those terms, e.g. “As a current student, which of the tasks below are most important to you to be able to complete on the Roosevelt website?” If a respondent had multiple relationships to the school (such as being both a staff member and an alumnus), we asked them to fill out the survey multiple times, changing the framing of how the tasks were presented each time. Once you’ve established which tasks are the top ones for your audience(s), you need to implement them on your site. Most likely, this will involve organizing your pages around the task that can be accomplished there, rather than the office that provides the service, and reorganizing your information architecture around groups of tasks. For example, we created a “Get Help” section for our current students that included both the Counseling Center and the IT helpdesk; it’s highly unlikely that any “Office of…” model would ever have put those two things together. As suspected, we found that our different audiences have very different top tasks. This may mean segmenting those audiences into separate sites, or finding some other way to keep one audience’s top tasks from getting in the way of another’s. Cut pages that do not support top tasks, and be merciless. This is easier said than done. People don’t like to be told their content is useless; data can help, but people get attached to their content. This is part of why we included this change as part of the redesign process; starting from an effectively blank slate can help a great deal, since people will often not even notice (sometimes for months or even years) that their less-than-useful content has disappeared. Keep testing. Implementing top tasks, like most things on a website, is a process rather than a project. While The Stranger’s Long Neck prepared me for much of the process of implementing top tasks on our website, there are a few things that I wish I had realized and prepared for better before I started on the process. Education and outreach are critical. People love their silos and they will not give them up without a fight. The idea of website as a tool for users rather than a repository for their information is not intuitive to people entrenched in the “office of…” model. We can’t build it and expect everyone to be on board immediately. We have to involve them in the process. Talk to the people on the front lines first. Your explanations about why you are implementing top tasks and how it will help your users will not trickle down to them if you go through the standard chain of command. Educating the students is just as important as educating staff. While they are probably more adaptable than a lot of faculty and staff, they’ll also be used to the old way of doing things and we need to explain our methods to them as well. Empathy for users must be learned. Putting oneself in the shoes of the user is easy for writers and designers. Empathy is our stock in trade, but this is not the case for many of our colleagues, especially those whose jobs depend upon the rigid following of processes. Choose concrete examples to illustrate the obstacles your users face and how your solutions can overcome them. Take stakeholders on the journey with you, let them see why the “office of” model can be difficult for our users. Data is great, but a single anecdote can override it in your stakeholder’s mind. You will have the same conversations over and over. And over and over. You will find yourself explaining the key concepts of top tasks and other user-centered design principles repeatedly, often to the same people. It can be frustrating, and it’s hard not to give into the feeling that “I am the expert, why do I have to justify these decisions to someone who doesn’t know anything about the web?” But don’t let it make you dismiss your colleagues’ concerns; channel that empathy for the user mentioned in the last point into empathy for your colleagues. After all, they are users too. You will have to compromise. If you choose this path, you will face a lot of hurdles. Some will be technical, most will be political. Your site will not become the platonic embodiment of Gerry McGovern’s methodology – I guarantee it. Don’t let the perfect be the enemy of the good. If you can find workarounds, embrace them; for example, to assuage concerns that offices would no longer have effective web presences, we built a new office directory that includes links to tasks for which each office is responsible. Implementing top tasks on your higher ed website is not easy. But the improvement is real. Visits to our top tasks for prospective students (apply, request info, programs/majors, visit) all increased significantly once we implemented our new design and top tasks-based architecture, and this fall we had more students entering the institution than leaving for the first time in five years. The website and the top tasks methodology can’t take full credit for that — we’re only one piece in a complex machine — but I’m certain that it helped. This post really only scratches the surface of McGovern’s methodology, so I highly encourage you to pick up a copy of The Stranger’s Long Neck. There’s also a Top Tasks: Higher Education Website Content group run by Bob Johnson on LinkedIn, with more than 500 members, which I recommend joining. And of course, I’d love to hear about your experiences in implementing top tasks in a higher education setting. It’s a common problem for those of us who work on the web: we never seem to have the time or energy to put into our personal sites. This was certainly the case for me — I hadn’t updated the look and feel of my site since 2010 (! ), it wasn’t responsive or mobile-friendly, and it no longer particularly reflected what I hope to get out of a personal site. Content-wise, I jettisoned a bunch of the sales-pitchy stuff (I’m not really looking for freelance work anymore) and have turned the focus to my blog posts, which I’ve now finally migrated from Blogger to the more flexible platform of WordPress. Design-wise… well, this cobbler’s child may finally have new shoes, but they are straight off the rack from Payless. I chose to go, for the time being, with the default “Twenty Seventeen” theme. It’s clean and gets the job done, and I knew that if I started spending time obsessing over the site’s design, I’d never get it launched. So I will go back and customize the design at some point, but for the time being I’ll have plenty of content-related cleanup to deal with (I’ve already found a few broken image links, and I’m sure there are more). As I’ve done the last few years, I’m posting a playlist of some of my favorite songs of the year for 2017. Rather than also post the list of my top 25 albums compiled for my annual higher ed web music nerd list, the songs are listed on the playlist in the order of my ranking (so, for example, She-Devils put out my favorite album of the year, Valerie June had my second-ranked, and so on). I had intended to recuse myself from including Americayana on the list, but just couldn’t resist the lure of getting to 25 albums. I’d love to hear what you think of the selections, and hope you all have a 2018 worth singing about. It’s been just over two weeks since Tom Petty died, and some time stuck in an airport last week finally gave me a chance to jot down my thoughts on one of my favorite songwriters. My generation has lost a lot of its musical heroes in the last few years. We’ve been through this before, of course — back in the 90s with Cobain and Staley and Buckley and Tupac and a dozen others who, to borrow the cliche from an earlier generation, burned out before they ever had the chance to fade away. In this second, most recent round of losses, some — Chris Cornell, Phife-Dawg — are our contemporaries, who managed to make it through the peak of their fame and go on to establish long careers, only to have them cut short by illness, whether mental or physical. Others — Prince, David Bowie — were like cool older siblings, or the badass aunts & uncles who showed us you could be our parents’ age but still keep surprising everyone. Tom Petty is the first of this recent group to whom I felt a real connection. I respected Prince and Bowie as artists, but their music never really did it for me. I owned and enjoyed (and still do) Soundgarden and A Tribe Called Quest albums, but they never really felt like “mine.” Petty’s music did, though. I wasn’t a fan from childhood. Yes, a cassette of Damn the Torpedos was in the rotation along with Bob Dylan and Huey Lewis and The Highwaymen in my dad’s truck when I would go visit him out west each summer, and I remember hearing the early stuff on the classic rock station that always played on the school bus, and the new stuff on the Top 40 station that I listened to because I didn’t know any better, and I remember seeing the video for “Into the Great Wide Open” at the houses of friends who had MTV. But it wasn’t until the Greatest Hits album came out, and “Mary Jane’s Last Dance” was suddenly everywhere, that something clicked. Somehow that adolescent switch had been flipped that turns some of us from people who hear music to people who listen to music, where what had been sonic wallpaper suddenly becomes the soundtrack to our own lives. By the time Wildflowers (still my favorite Petty album) came out, I’d discovered a whole new way of listening, like the shift from black-and-white to color in The Wizard of Oz. And heard through that filter, Petty was unique among the songwriters I heard around me. He wasn’t creating surrealist wordscapes like Dylan or his grunge-era heir apparent, Beck. He wasn’t dramatic, confessional and angsty like Eddie Vedder and Adam Duritz (two other songwriters I idolized back then, but whose output has not aged nearly as well as Petty’s). He was crafting these understated impressionist short stories of characters in a moment in time, with enough specificity to create a mise-en-scène but leaving just enough space to allow your imagination fill in the gaps. In “Time to Move On,“ a woman is “moving through the airport, she’s an honest defector, conscientious objector, now her own protector;” I swear there’s an entire novel waiting in those two lines. Yet Petty also seemed to never take himself too seriously. A deep sense of empathy for his characters lives side-by-side with a great sense of humor— the line in “Down South” where his narrator is “gonna impress all the women, pretend I’m Samuel Clemens, wear seersucker and white linens” never fails to make me smile. And on songs like “Free Fallin’,” he was able to take two-and-a-half chords and make them simultaneously anthemic and achingly intimate, timeless and completely of the moment. He was one of the artists who made me want to write songs, and his fingerprints are all over just about every song I’ve written in the last fifteen years (there’s a particularly obvious nod to him in the “it’s good to be king” line in “A Small Sacrifice”). If I ever manage to write anything even half as good as one of his tunes, I’ll consider my little hobby a perfect success. Most of the songs on Americayana were written and recorded in the order they appear on the album, but “Burn So Bright” is the major exception – it was the first song written for the album, and in a lot of ways laid out the framework of the whole project. The spark of the idea that became “Burn So Bright” came more than ten years ago, while listening to a song that might as well be Holy Scripture within the country music canon: “Ring of Fire,” by Johnny Cash. I had spent some time in grad school studying a famous episode that pops up some form in nearly every version of the Ramayana: the agnipariksha, or the test of fire. In most versions of the story, Sita, the wife of the exiled king Rama (who is usually considered to be an avatar of the god Vishnu, sent to earth to destroy the ten-headed demon Ravana) is kidnapped by Ravana and taken to his kingdom of Lanka. Rama leads an army to defeat the demons, kill Ravana, and free Sita. But then a curious thing happens: Rama tells Sita that, since she has lived in another man’s house, she has been defiled; while it was his duty to save her, she’s no longer worthy of being his wife. Sita declares that she remains entirely pure and not only never allowed Ravana to touch her, but never let her mind wander from Rama. She then (depending upon the version) either orders that a fire be built so that she may enter it to prove her purity, or is told by Rama that such is the only way he can be sure of her faithfulness. Sita enters the fire and remains untouched by the flames, proving her purity and giving Rama the justification to take her back (there are also versions in which Rama and Sita are described as planning the whole thing to happen as it did, with a shadow version of Sita created specifically to be kidnapped by Ravana, while the real Sita was spirited off for safekeeping by the fire god Agni; in these versions the fire test is simply how the real Sita is returned to our world). With the story of the fire test bouncing around in my head, all it took was hearing the chorus of “Ring of Fire” one day to suddenly make me realize that at its core, the narrative structure of the Ramayana is basically that of a country tune: a seemingly true love destroyed by suspicion, with the murder of the “other man” thrown in to make it extra juicy. By that time I had also encountered the work of Nina Paley, who was at the time creating some fantastic Flash animations of characters from the Ramayana set to the songs of Annette Hanshaw (she would eventually bring them all together in the fantastic full-length film, Sita Sings the Blues, which you can watch or download for free). Nina’s work helped make clear to me the potential for cross-pollination in two ostensibly very different artistic traditions. Like many versions of the story that I had read or heard, her work also highlights just how unfair and misogynist the entire notion of the fire test is (the versions where Sita is hidden by Agni that I noted above would seem to be attempts to deal with the uncomfortable idea of a supposed paragon of virtue acting like such a cruel jerk). 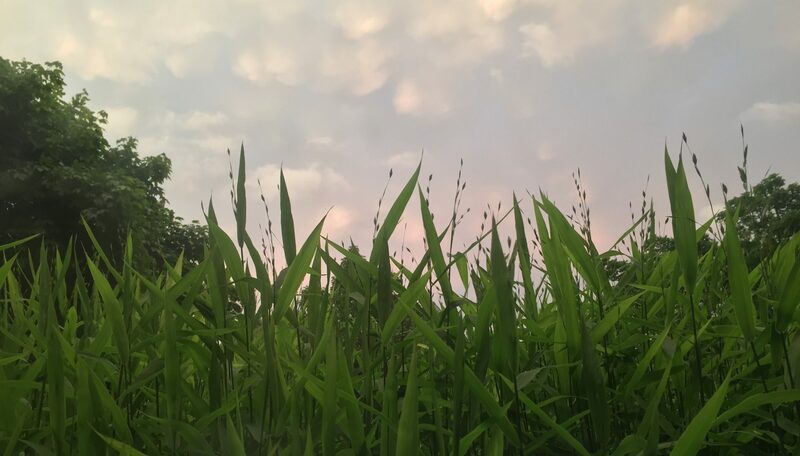 So, when I decided to write a country song retelling the Ramayana, I wanted to accomplish two things: to reframe the story within the idioms of country music, and to retell the story from Sita’s perspective. The first task wasn’t tough; I didn’t quite know yet why the Rama character was out on the road, but the ramblin’ exile is an established trope in the genre. The Ravana character, instead of disguising himself as a mendicant sage to kidnap Sita as in most versions of the story, becomes a door-to-door salesman of bibles and knives who just happens to be in the right(?) place at the right time. Along the way, the theme that emerged from the Sita character’s perspective was how hard, even infuriating, it must be to be married to someone who can (or thinks they can) do no wrong: “best intentions make an awful mess,” as she says in the song. Perhaps, faced with living with that kind of self-righteousness all the time, she might have actually been looking for a way out, and who could blame her? In this version, she becomes the agent of what happens to her rather than the object. After I finished the song back in 2008 or so, I took it to my band at the time, The Lost Cartographers. Our keyboardist, Erin Fusco, gave it a compositional polish, adding in the chord changes in the pre-chorus and the outro, and together the band performed it live a number of times. Eventually we figured it didn’t quite fit with some of the other songs were doing, and I decided that someday I was going to do a Ramayana concept album that I would somehow fit “Burn So Bright” into. While it was the first song written for the album, its recording was done in sequence, so I had already finished a good chunk of the album before I sat down to record this. Given the relatively mellow songs on either side of it I decided I wanted to keep the rocking feel of the Lost Cartographers’ version, but maybe even kick it up a notch into a kind of messy garage rock tune. The stomps and claps that provide the backbone of the percussion for the song were recorded in my dining room (I love that you can still kind of hear the glasses in our wine rack clinking together), and were recycled from a recording of “My Name Is Charles Guiteau” that I did as a promotional piece for a production of Assassins. My lovely wife provided the vocals, one of two songs on the album in which she provides the voice of our heroine. Inspired by one of my favorite podcasts, Song Exploder, I’ve decided to do a series of blog posts about the making of my new album, Americayana. One of the questions that I’ve gotten a lot over the last few years when it came up in conversation that I was working on a alternative country album about Hindu mythology(no, seriously, it did actually come up in conversation) was: how did you get interested in all this? The truth is that I’ve been interested in “mythology” – which we’ll define for the sake of expediency as “shared narrative traditions concerning the heroic or divine” – since I was a small child. In first grade, when each of us had to bring a book to read to the class, I chose a child’s adaptation of the story of Demeter and Persephone. From Greek mythology, I moved on to Arthurian legend and Celtic myth, and designed my own major in Comparative Mythology at Oberlin College. It was at Oberlin that I first found out about the story of Rama and Sita, in a class on Hindu Mythology taught by one of the greatest teachers I’ve ever had, Paula Richman. Through her classes and her books (I can’t recommend the edited volumes Many Ramayanas and Questioning Ramayanas highly enough) she made me see not only what great stories were contained in this diverse narrative tradition, but also how compelling they had been – and still are – to millions of people across thousands of years. I learned about not only the historical epic, first written down in Sanskrit between 300 BCE and 300 CE, but about how these tales still provided models for how people could and should live their lives in media as diverse as 1980s state-run Indian television and Indonesian shadow-puppetry. I learned about the ways these stories were still vibrant in everything from art-house LGBT cinema to fundamentalist politics and everything in between. I was, in short, hooked. One of the subjects of my honors thesis was the relationship of Rama and Sita, and I went on to do a master’s degree and several years toward a Ph.D. in History of Religions at the University of Chicago Divinity School, studying (among other things) the way that tellings in different media changed the story of the Sita’s trial by fire and uses of the Rama story in anti-Muslim Hindu nationalist activism. I spent a summer in Jaipur, Rajasthan, studying Hindi. And while I never did finish that Ph.D., I also never lost my love for these characters, or for the storytellers who have brought them to life over and over in so many different forms for so many centuries. Americayana is my own humble contribution to that tradition, and over the rest of the posts in this series I’ll share some of the stories behind the songs. Of course, if there’s anything specific you’d like to know about, leave a comment and I’ll be sure to address your question. Thanks for listening!